The DCI World Championship Prelims will return to Lucas Oil Stadium in Indianapolis this August, and for the 14th year in a row, that kickoff event can be watched live in hundreds of movie theaters nationwide. 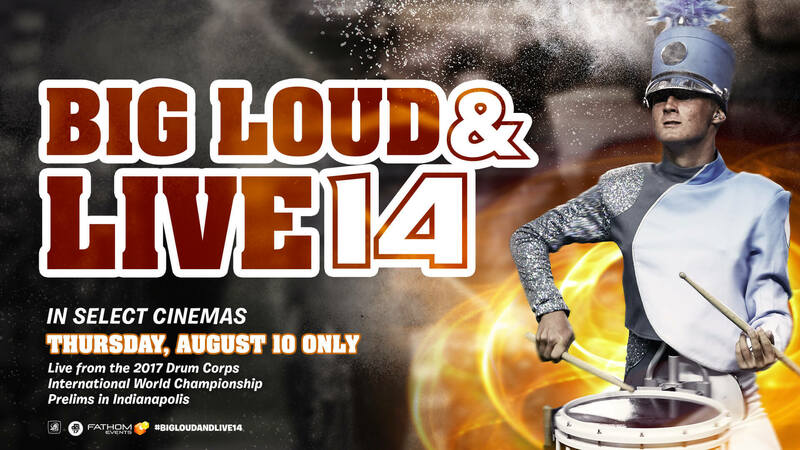 “Big, Loud and Live 14” will bring the performances of the top-15 scoring corps (from a field of 39) competing at the DCI World Championship Prelims on Thursday, August 10, to more than 600 select movie theaters across the United States. The more than five-hour event will start at 6:30 p.m. ET / 3:30 p.m. PT on August 10. A complete list of theater locations (subject to change) can be found at FathomEvents.com. Tickets for “Big, Loud & Live 14” can be purchased online or at participating theater box offices. The suggested ticket price is $18, but may vary based on location. Drum corps fans are encouraged to order tickets in advance as some theater locations may sell out.